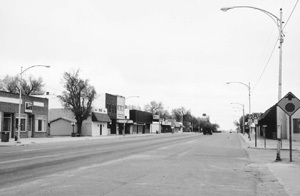 Small towns in the Great Plains generally developed as a result of a connection to a transportation network that linked the town and the surrounding area to the more densely settled regions to the east. The basic economic role of most small towns was and still is to serve as nodes of collection for agricultural goods produced in the region for transport outside the region and as supply centers for area residents. Resource extraction is the economic basis for several communities, but this is a far less common role. Northwestern North Dakota, for example, has a network of towns dedicated to coal mining, and southern Saskatchewan has multiple communities engaged in mining potash, but resource-oriented towns are vastly outnumbered by agricultural towns. The early small towns (Nebraska City in Nebraska Territory and Yankton in Dakota Territory, for example) developed along the Missouri River, but it was the railroads that were responsible for the creation of the greatest number of small towns on the Plains. Railroad officials or their agents spaced communities at specific intervals along lines in an effort to maximize economic efficiency. The distance a farmer could transport grain to an elevator determined the space between each elevator and thus between each accompanying town. This town pattern, introduced in the latter decades of the nineteenth century, is still evident today: grain elevators remain the dominant town feature looming on the horizon at regular intervals as one travels through the region. Standardized morphology characterizes railroad communities. Towns bisected by tracks, Main Streets perpendicular to the tracks in a T-town pattern, and Main Streets crossing the tracks are all characteristic forms on the Plains. The ascendancy of towns along rail corridors occurred largely at the expense of small towns dependent on river transportation, especially those unable to attract the new mode of transportation. Today, however, the importance of the railroad for each community is vastly diminished from the days when the railroad was often the sole connection to the larger world. The transportation revolution in the twentieth century altered the economic foundation of Great Plains communities. The rise of the automobile and the construction of a road network have been the greatest factors affecting the fate of these small communities. The automobile allowed rural consumers as well as residents of small trade centers to bypass local merchants in favor of cheaper and larger selections in higher-order regional centers or even metropolitan areas. In South Dakota and Nebraska, where license plates designate the county in which a car is registered, rural consumers can be easily identified in the parking lots of malls in Rapid City, Sioux Falls, Lincoln, and Omaha. With the railroad tracks grassed over or torn up altogether and with residents shopping and attending school in larger towns, many small towns (particularly those under 500 population) have gone into protracted decline. Their Main Streets have a gap-toothed appearance, with a significant number of buildings abandoned or in a state of disrepair. The case of Purcell, Oklahoma, thirty miles south of Oklahoma City, serves as an example of how outside forces buffet small places. Founded by the Santa Fe Railroad in 1887, the town became a major node of the railroad in southern Oklahoma. Purcell weathered the Great Depression better than many small communities on the Southern Plains, but most of the employment related to the railroad was consolidated in Oklahoma City after the end of World War II. A line, still used, passes through town. Its main function now is the transportation of agricultural goods to the national market. No longer tied to the fortunes of the railroad, the community was forced to adjust to a new role in order to survive. Today the local chamber of commerce touts Purcell's proximity to Interstate 35 and the Oklahoma City metropolitan area as assets. While Amtrak has a stop in Purcell, most of the functions related to the railroad are long gone, and tourism is now the main source of revenue. The town's Main Street reflects this tourist orientation. Businesses designed to capture the tourist dollar such as antique shops are interspersed among businesses catering to the local residents such as lawyers and insurance offices. A second challenge for small towns is the impact of agricultural restructuring. As farms and ranches in the region become larger in size and fewer in number, the total number of spenders and consumers in the small towns decreases. The slow decline in the number of jobs in the area affects the communities in a manner similar to towns dependent on a declining mining sector, although the slide is much more gradual. The decreasing number of dollars spent in town from the hinterland drastically impairs the economic health of the community. A variety of efforts may be made to add jobs to a town and arrest its decline. While many small or medium-size meat-processing facilities have operated in Plains towns for decades, several experienced dramatic change after meat-processing companies constructed large facilities in their communities. As older, higher-wage facilities in the eastern Midwest closed, new plants opened in cities such as Lexington, Nebraska, Garden City, Kansas, and Guymon, Oklahoma. The influx of people to these communities in the years immediately following the construction of the plants greatly altered their ethnic character. For example, Lexington had a population of 6,601 in 1990. Ten years later, the population had increased to 10,011, of whom 5,121 were Hispanic. Changes in the composition of school population, religion (especially increased Roman Catholicism), cuisine, the visible landscape, and many other aspects of life have enriched places like Lexington, but the rapidity of change has also brought stress to long-established residents for whom continuity was long the norm. Small towns that diversify economically tend to be more secure. For instance, the presence of a state or private college provides insulation from shifts in the agricultural economy. Communities also seek economic diversity by competing with each other for new correctional facilities. Prisons virtually guarantee a constant payroll for the community, with wages that are usually higher than those paid by existing local jobs. Sterling, in northeast Colorado, is one such place that succeeded in attracting a prison and is now tied to the criminal justice economy of the state. Today several of the towns with the brightest prospects are those that lie along a major transportation corridor such as one of the interstates crossing the Plains. For these towns, the market comes to them in the form of motel and restaurant customers or truck repairs and gasoline sales. Towns adjacent to a metropolitan area have also prospered. A significant segment of workers residing in such towns departs to the nearby city for daily employment. Dell Rapids, South Dakota, for example, is twenty miles north of Sioux Falls by interstate or U.S. highway. Many of its 3,000 residents commute to Sioux Falls, helping to buoy the economy and maintain the population base of the town. The economic base of Dell Rapids has shifted from its traditional agricultural and quarrying roles to that of a commuter exurb. From their inception to the present day, small towns in the Great Plains have been economically bound to the metropolitan areas of Canada and the United States. Whether they served (or still serve) as bases of resource extraction or as points of collection for agricultural goods, a main purpose was and is to move raw materials out of the region to the more densely settled areas of each country. Processing and refining activities were generally located on the margins of the Plains or outside the region. The new meat-processing plants represent an overall shift of placing value-added industry on the Plains, at least for one economic function. However, the processing centers require large markets to consume their products; thus the linkages to higher-order places remain fundamentally unchanged. In a similar fashion, the new prisons are linked to metropolitan areas in the sense that a significant portion of the incarcerated population originates from the cities. Therefore, much of the recent economic development of prospering small towns on the Plains is still dependent on their ties to larger places. Hudson, John C. Plains Country Towns. Minneapolis: University of Minnesota Press, 1986. Hurt, Douglas A. "Railroad Influence on a Small Town Main Street: A View of Purcell, Oklahoma." North American Geographer 1 (1999): 64-79. Stull, Donald D., Michael J. Broadway, and David Craig Griffith, eds. Any Way You Cut It: Meat Processing and Small-Town America. Lawrence: University Press of Kansas, 1995.